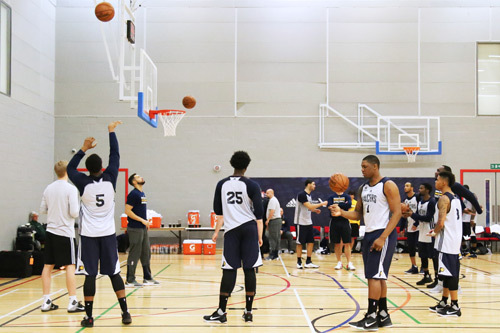 City, University of London has played host to two world-famous basketball teams. The Denver Nuggets and Indiana Pacers visited the UK for NBA Global Games London at The O2 arena on Thursday 12th January. The two teams spent the week leading up to the high-profile game at CitySport, putting in practice time in the basketball hall. The match marked the National Basketball Association’s seventh regular-season game in London. Leading the Indiana Pacers was three-time All-Star and one of basketball’s biggest stars, Paul George. It was the first time the Indiana side have played a regular-season game outside of North America. I went to the University of Michigan, back in the States. I worked really hard to get my studies done so I could get back in the gym, play basketball at night and work hard at my craft. Try to perfect it – it’s time-consuming, but it will pay off. I love the facility, it’s really nice and I’m glad we had the chance to come here to practise. I like the multiple baskets, it means we can do a number of different drills. Alongside the training sessions, the NBA, in partnership with Basketball England, hosted a coaching clinic for local schools and basketball team coaches attended by more than 200 coaches. Neal Meyer, NBA EMEA Associate Vice President – Basketball Operations, introduced the session and spoke about the growing interest in basketball across the world. Later, Denver Nuggets assistant coach Chris Finch talked about how the NBA is keen to transfer knowledge to help the game grow in the UK. He spoke about how basketball coaches are less protective of their ideas and that clinics are invaluable for learning and sharing knowledge. CitySport is the largest student sports facility in central London. It was chosen as a venue for the teams to train due to the high-specification of the Sports England standard sports hall.